The colorful Indian blue peacock (pavo cristatus) is known for the male’s impressive tail of many brilliant colors. Peacock refers to the male, while the females are called peahens, while “peafowl” is generally used to cover birds of both sexes. Peafowl originated in and around India and Ceylon but when the British Empire conquered India, they spread peafowl all over Europe and America. Suddenly, white peafowl began to appear and are now bred for that color in captivity. White peacocks are not albinos. Albino animals and birds have a complete lack of color and red or pink eyes. White peafowl have blue eyes. 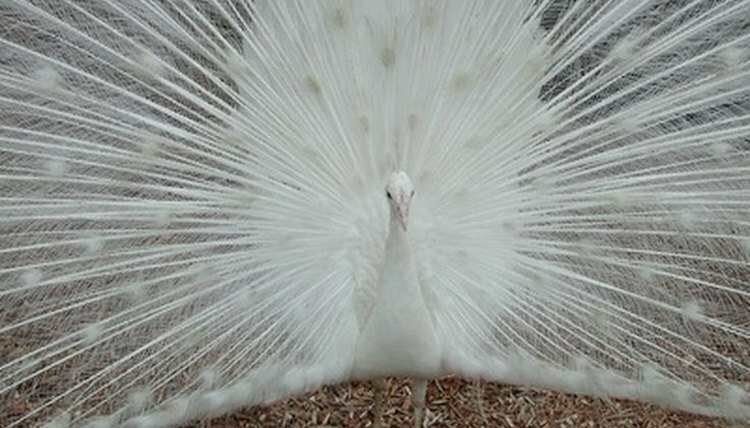 The white color appears in other domestically bred peafowl but in different quantities. Chicks are born yellow and become white as they mature, according to the Peafowl Varieties Database. Indian peafowl of all colors, including white, have pink skin. A wide variety of color patterns have appeared in peafowl bred in captivity. The include the white; the pied white, which is a combination of white and the usual Indian blue colors; the blackshoulder pied, where the coloration is normal except for white under parts, wings and a spot under the chin, and the blackshoulder peahen, which is white sprinkled with black spots, according to the Peafowl Varieties Database. According to United Peafowl Association Knowledge Base, the first color variation was the blackshoulder, which appeared in 1830. When the white first appeared is unknown. White, pied and blackshoulder color patterns of Indian blues are not often found in the wild. Any patches of white would make the bird more visible to predators. The theory is that in the safety of being in captivity, their recessive coloration genes have emerged. This has also happened in pet birds such as the zebra finch and other animals like the gerbil and the Syrian hamster. Unlike gerbils, hamsters or even zebra finches who may be more subdued, white peafowl act just as unpredictably as their colored peafowl brethren. They are not usually tame birds, although exceptional individuals handled with care all of their lives may be more tame or at least tolerant. They will try to escape from pens, peck at or kick anyone that tries to touch them. Male peacocks of any color pattern have an extremely loud braying call that can be heard for miles. Peafowl of any color can fly. When white peacocks are bred to white peahens, all of their chicks will be white. White peafowl also contain the genes for blackshoulder and pied color patterns. If mated to different colored birds the result will be a wide variety of colors in the chicks. Peacocks breed with a harem of up to five peahens. Peafowl generally live somewhere between 10 and 20 years in the wild, whereas in captivity, there have been peafowl reported to have lived up to 50 years. Peahens usually lay what is called a "clutch" of about six eggs, incubating them for nearly a month before they hatch. Chicks are able to fly for short distances only three days after they are hatched.